If you don't like being one of the crowd on a large cruise ship, Voyager could be a great choice. 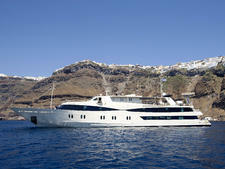 The feel is more like that of a luxurious private yacht, with 36 cabins and a sleek, modern design. The ship's furnishings are chic and sophisticated, with a color palate of neutrals and light wood. Higher-tier cabins have large windows, and the lounge and dining room offer wraparound views through picture windows lining the three exterior sides of the spaces. Variety Cruises specializes in smaller ships, and the line's sweet spot is a blend of shore excursions that include both cultural and active experiences. 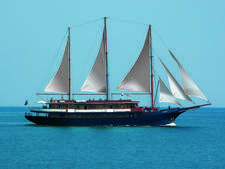 Because of its size and agility, Voyager can visit ports that might be problematic for larger ships, and its water sports deck allows for swimming from the ship when conditions permit. Passengers need to be fairly agile because there are no elevators linking Voyager's five passenger decks, and the ship uses two Zodiacs as tenders. However, Zodiac loading and unloading is swift, and waits are blissfully minimal. The multilingual crew provides exceptional service, and crewmembers go out of their way to honor special requests. The atmosphere onboard is relaxed, and the captain has an "open bridge" policy, even inviting passengers up for a look at navigation maps of the Panama Canal. 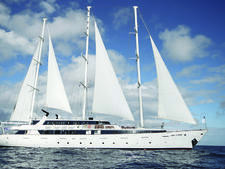 As a small ship, Voyager doesn't offer vast choices in entertainment, dining or onboard activities. 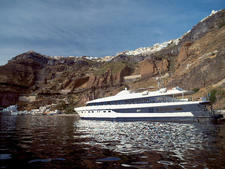 The vessel also lacks a swimming pool. However, we never felt bored. The itinerary kept us busy, conversations with fellow passengers were lively, and a pool seemed unnecessary when we were able to lounge on pristine beaches or swim off the back of the ship. 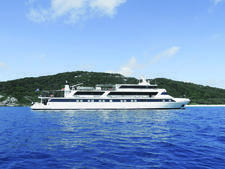 Passengers aboard Voyager can range from young newlyweds to active seniors. Fellow passengers on our sailing weren't necessarily serial cruisers but tended to be avid international travelers. They chose the ship primarily for its itinerary and size. On our Central America cruise, passengers were from the U.S., Spain, Argentina, France and Britain, with the majority being from the U.S.
Programs and announcements are offered in English, but most of the crew speak at least two languages, including Spanish, French and Greek. There are no special programs or activities to attract families, though active shore excursions, such as hiking and zip-lining might appeal to teens. 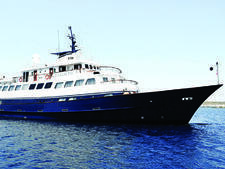 Because of its size, Voyager is also regularly used for charters. There is no dress code onboard. Shorts, T-shirts, flip-flops and bathing suits tend to be the norm during the day, with some cruisers switching to resort wear in the evening. The captain's farewell dinner sees passengers stepping it up a bit, with women donning heels and men in jackets (but ties are rare). Because there are wet landings, water shoes are a helpful item to pack. The ship provides beach towels for any activities involving swimming. Terrycloth bathrobes are provided in the cabins for all passengers. Tips are not included, and the cruise line requests that passengers not tip individual crewmembers. The policy is to provide tip envelopes for passengers, which are turned in at the reception desk at the end of the voyage. Tips are then split among the entire crew. The recommend tipping range is $105 to $130 per passenger, per week. 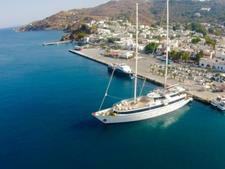 Onboard prices are quoted in euros, but payments can also be made in U.S. and Canadian dollars. All onboard expenses are put on passengers' accounts, with settlement at the end of the cruise. The line accepts Visa, MasterCard and American Express credit cards, as well as cash.